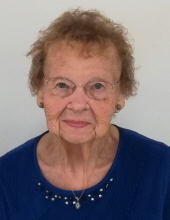 Mrs. Martha Jane Harless Lane of Millers Creek, passed away Friday, November 23, 2018 at Wake Forest Baptist Medical Center in Winston Salem. Graveside Memorial services will be held 2:00 PM Monday, November 26, 2018 at Scenic Memorial Gardens with Rev. Shannon Critcher and Rev. Jim Gore officiating. Mrs. Lane was born in Ashe County to David and Nellie Lou Little Harless. She was a member of Millers Creek Baptist Church and a homemaker. She was preceded in death by her parents, three brothers; Mac, Gwyn and Jack Harless and a sister; Willa Grey Miller. Mrs. Lane is survived by her husband; Frankie Lane of the home, two daughters; Sandra Church and husband Darryl of Roanoke, VA and Shelley Brucker and husband Steve of Millers Creek, three grandchildren; Madison, Cassidy and Macy Church and sister in law; Grace Harless, nieces and nephews, “daughter” Melody and many friends. In lieu of flowers, memorials may be made to Shriners Hospital 950 West Farris Road Greenville SC 29605-427. To send flowers or a remembrance gift to the family of Martha Jane Harless Lane, please visit our Tribute Store. "Email Address" would like to share the life celebration of Martha Jane Harless Lane. Click on the "link" to go to share a favorite memory or leave a condolence message for the family.